We have a hypothetical data file, ztp.dta with 1,493 observations. 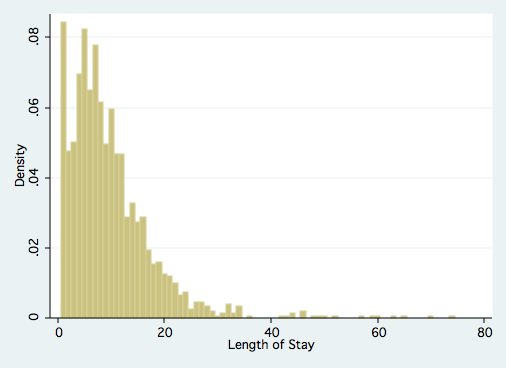 The variable describing length of hospital visit is stay. The variable age gives the age group from 1 to 9 which will be treated as interval in this example. The variables hmo and died are binary indicator variables for HMO insured patients and patients who died while in hospital, respectively. These are the same data as were used in the ztp example. Zero-truncated Poisson Regression – Useful if there is no overdispersion in the zero truncated variable. See the Data Analysis Example for ztp. The tnbreg command will analyze models that are left truncated on any value not just zero. The ztnb command previously was used for zero-truncated negative binomial regression, but is no longer supported in Stata12 and has been superseded by tnbreg. It begins with the iteration log giving the values of the log likelihoods starting with a model that has no predictors. The last value in the log (-4755.2796) is the final value of the log likelihood for the full model and is repeated below. The header also includes a pseudo-R2, which is very low in this example (0.0033). Below the header you will find the zero-truncated negative binomial coefficients for each of the variables along with standard errors, z-scores, p-values and 95% confidence intervals for each coefficient. The output also includes an ancillary parameter /lnalpha which is the natural log of the over dispersion parameter. Below that, is the the overdispersion parameter alpha along with its standard error and 95% confidence interval. Finally, the last line of output is the likelihood-ratio chi-square test that alpha is equal to zero along with its p-value. The value of the coefficient for age, -.0156929, suggests that the log count of stay decreases by .0156929 for each unit increase in age group. This coefficient is not statistically significant. The coefficient for hmo, -.1470576, is significant and indicates that the log count of stay for HMO patient is .1470576 less than for non-HMO patients. The log count of stay for patients that died while in the hospital was .2177714 less than those patients that did not die. The value of the constant (_cons), 2.408328 is log count of the stay when all of the predictors equal zero. The estimate for alpha is .5662957. For comparison, a model with an alpha of zero is equivalent to a zero-truncated poisson model. The likelihood-ratio chi-square test that alpha equals zero is 4307.07 with one degree of freedom. This is significant result indicates that the negative binomial model is a better choice than a poisson model. We can also use the margins command to help understand our model. We will first compute the expected counts for the categorical variable hmo while holding the continuous variables age and died at their mean values using the atmeans option. Please note that the unit for stay is days and not log days for the margins command. The expected stay for non-HMO patients was 9.502, days while it was 8.203 days for HMO patients. Using the dydx option computes the difference in expected counts between HMO and non-HMO patients while still holding the other variables at their mean value. As shown above, HMO patients spend 1.299 days less in the hospital than non-HMO patients when the other variables are held at their mean levels. One last margins command will give the expected counts for values of age variable from one through nine while averaging across the two levels of hmo and died. We will show these results even though age was not statistically significant. A number of model fit indicators are available using the estat ic command. ztp — zero-truncated poisson regression. Cameron, A. Colin and Trivedi, P.K. (2009). Microeconometrics using stata. College Station, TX: Stata Press. Cameron, A. Colin and Trivedi, P.K. (1998). Regression analysis of count data. Cambridge, UK: Cambridge University Press.